2001: A Space Odyssey - Monolith? The designer of the Proximas, Piotr Galkowski admits to be influenced by the monolith from the 1968 film 2001 a Space Odyssey directed by Stanley Kubrick. When you see these speakers this influence is obvious. 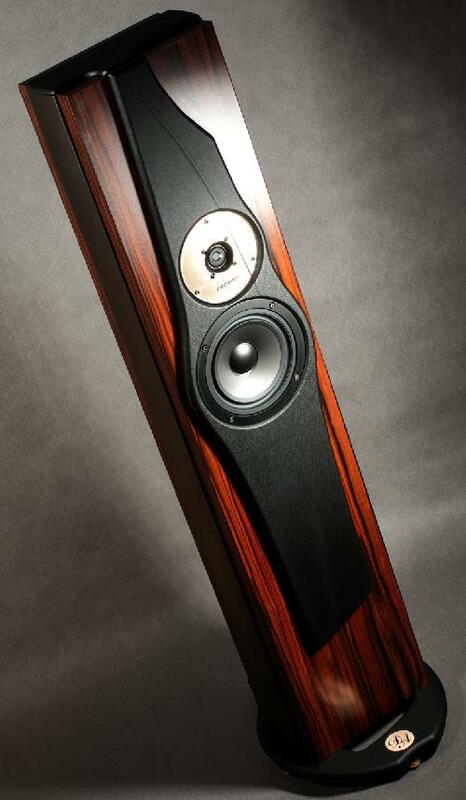 Whilst the idea was developed from the film the actual speaker proportions were carefully chosen to make the Proximas seem smaller than they are. The front panel is finished in leather with the grilles fixed in place with neodymium magnets. The rear panel is also finished in leather and most unusually, has a clear acrylic plate through which you can see the crossover. The design is a two way using matched drivers. The woofer has a 17cm polypropylene diaphragm, die-cast basket and inverted rubber surround. The tweeter is a light 28mm woven silk dome type with a rear chamber behind the magnet designed to control and suppress vibrations using a mixture of fractioned sand saturated with oil. The tweeter is mounted on a set of gaskets of different thicknesses, hardnesses and damping coefficients so as to damp any vibrations improving the response to small signals. The crossover is a second order design using Jantzen Z-Superior, Z-Silver, Z-Standard and Cross-Cap capacitors and no resistor divider networks to give an open and transparent sound. The coils are made using OFC wire and carefully weighed and measured to ensure consistency. The feed from the terminals to the crossover is through OFC strips and from the crossover to woofer via 2.5mm sq litz cable. The tweeter is fed via R-core cable of 0.85mm2. The review pair of Proximas are finished in a African Ebony matt melamine, they are also available in real wood veneers plus high gloss black and british racing green. The efficiency is specified as 89dB/W and they weigh 20kg each. The build quality is excellent and the leather panel on the front is an interesting, eye catching change from the norm. I am not a fan of the vinyl effect veneers but the African Ebony on the Proximas is excellent. If I was buying these speakers I would choose the realwood "Latte Venge" or perhaps the "British Racing Green" though they may not pass the test of my colour guru! The installation was very simple. After unpacking the oval base is fitted to each speaker using 4 allen bolts. The bases have 4 shallow spikes to ensure a solid footing and are finished in the same leather as the front and rear panels. What is curious is the base has a circular cut out where the speaker mounts, you might think there is a down firing port but this is not the case as it is a closed box design. The impact of the hole in the base is that the speakers can rock backwards and forwards slightly, perhaps this is deliberate but I would have thought a more solid mount would give a better foundation for the bass? As the speakers are not reflex loaded they can be positioned close to the rear wall, the depth of the base at the rear is all that limits how close. In my room I cannot place them close to the rear wall because of the dorma window and sloping roof line. I found that moving the Proximas closer to the side walls helped to fill in the bass a little without significantly degrading the sound stage. 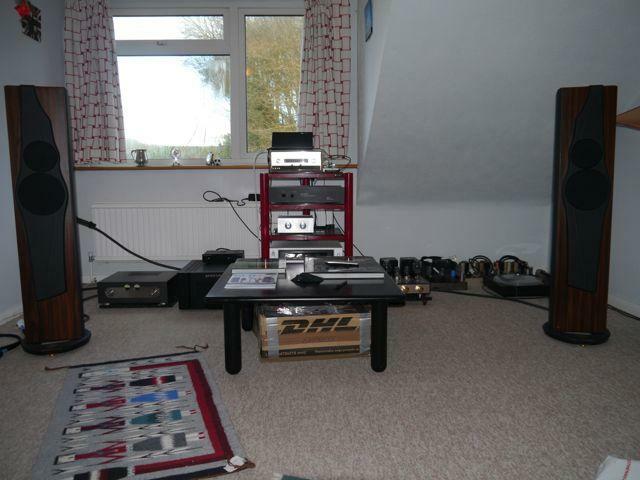 My listening experience with the Proximas started with them powered by the Encore 7 Eggshell Prestige 15WS amplifier. The sound was very detailed and with the right recording the soundstage the best I had ever heard. The Tallis Scholars recording of the Allegri Miserere was stunning with the ambience of the venue and depth clearly portrayed. I then switched to using my Emotiva XPR-2 power amplifier with the MFA transformer volume control pre-amp. With the Egg-Shell amplifier the sound was fine as long as you did not use too much volume. As I explained in the review of the amplifier it was the first time I could turn down the volume and still enjoy the music as the sound stayed consistent without collapsing and losing the enjoyment. Whilst using the Egg-Shell I enjoyed greatly the experience, but it felt as though the Proximas would benefit from more power. Using the Emotiva XPR-2 power will never be a problem as they deliver 600W per channel, and in practice, the system always sounded limitless, as you might expect. The compromise was a lower level of detail. The rest of the review was completed with the Emotiva. With the amplifier choice settled, I relaxed into a serious listening session with Eva Cassidy and "Live at Blues Alley", what a wonderful experience. The resolution of the Proximas, along with the limitless power of the Emotiva, gave a breath taking rendition. The small noises of the live performance came through so it was like being there. This attention to the small details in the recording had a negative impact, you can hear faults in the recording due to the live performance, the occasional distorted sound and electrical noise. The dynamic swing of the music comes across well, Eva singing quietly and then belting it out, superb. My usual test album was up next, Mary Black and "Collected" from 1984. My two favourite tracks being, the first "Song for Ireland" and the last "My youngest son came home today". The bodhran is used on many of the tracks and in particular the last and it comes across with good definition. Some speakers can really mess this track up with the bodhran losing the thwack as the cipin (drum stick) hits the skin and the following decay. Mary Black's voice is portrayed with a rich tone and great presence, it can easily sound thin and a bit flat in some systems. The final album of the evening needed to be something quieter to avoid disturbing the neighbours so on the turntable went Michala Petri with the Academy of St. Martin in the Field and the William Babell concerto in C Op. 3 No.1. This recording has tremendous bounce at the beginning. The rhythm is infectious, whilst at the same time the tone of the descant recorder is rich and full bodied. While the Proximas with the Emotiva are not as good at low volume as the Proximas with the Eggshell amplifier, they are still much better than your average setup and make for a most enjoyable late night listen. To start the next session, on to the turntable went a classic album, "Time Out" from The Dave Brubeck Quartet, one of my all time favourite Jazz recordings. The detailed nature of the Proximas shone through on the first track "Blue Rondo a la Turk". Joe Morello constantly stroking the hi-hat cymbal from the left speaker was projected very realistically into space somewhere near, but not from, the left speaker . My last album for this review is Bob Marley and the Wailers "Legend", their "best of" from 1982. In my experience the reggae style is hard to reproduce on a domestic audio system. The Proximas give it a good go, but the small bass drivers are never going to deliver the weight of sound that Bob and the Wailers produce. What they do capture well is the complex rhythms of the percussion and emotion in the vocals, I will give them 8/10 for effort! I really enjoyed my time with the Proximas, they are taller than your average domestic speaker, do not dominate the room, while at the same time looking good. The lack of a reflex port makes them easy to position and the bass is clean with good rhythm. The resolving ability is above average, the quality of the crossover really counts here. I could easily live with these speakers, they are very well made and are offered in a range of finishes that should meet with approval in most domestic situations. Finally I would like to thanks Michael Redman for his work proof reading my ramblings. Without Mike's input there would be too many spelling, grammatical and typing mistakes.